The theme I’m using on Cocoanetics.com has gone to version 1.6.6 which is to say that over the past 2 years our designer has done an awesome job to polish the look. I think it is about time that I give a shout-out to Jeremiah Tolbert from Clockpunk Studios who is in charge of this all. 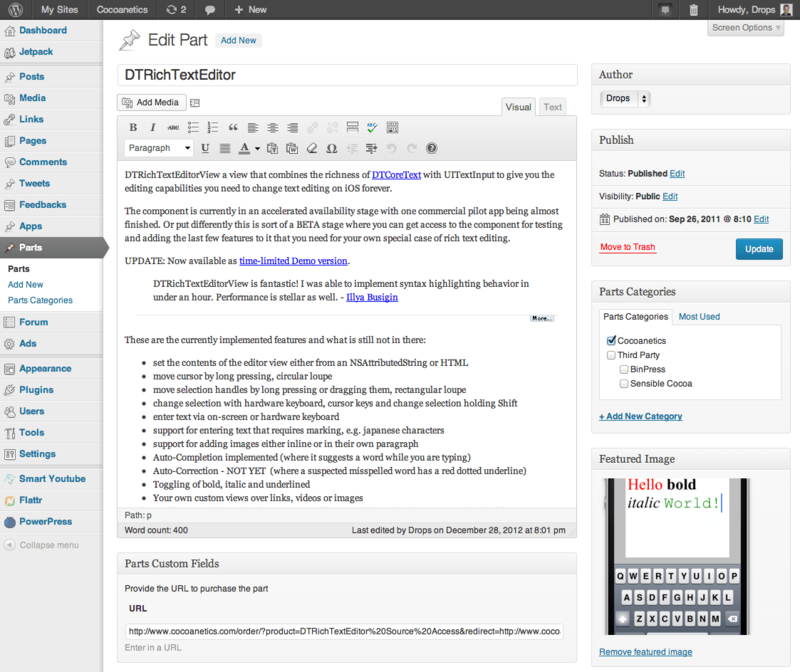 The latest version brings a few small things aimed at improving readability and make reading our blog smoother. If you click on the Read More button on either the homepage or blog list, then that scrolls such that you can continue reading and don’t have to restart from the top. This also gives slightly better prominence to the banner ad that shows on every page where the wordpress MORE tag is located. You read the intro, click on the button, see the banner ad and continue reading. Smooth! I wanted to have a fresher look for block quotes. Previously it was a blue bubble that instinctively I found extremely ugly and so I never used it to quote somebody. Having a good look for quotes also increases the likelyhood that I might do very short posts, Daring-Fireball-like where I might quote somebody and then give my 2 cents to it. This is especially interesting for times when I am inundated with work and might not have time to put together long-form tutorial posts. Finally I finally got justification. Not to say that I am always right, but I am – of course – referring to the how text is set. Justified text has a visual even edge left and right and allows the eye to ping-pong between these. You have a feel of better structure and reading is less tiresome. I love what you have done do the place! Ever since I first got the new design delivered I’ve been meaning to give a guided tour about the features that Mr. Tolbert built into my template that make it uniquely fitting to what we do here at Cocoanetics. Cocoanetics has 3 kinds of content: posts, apps and parts. Of these only the first one comes with WordPress, the other two where added as custom-types so that I can treat them slightly different. For apps I want to be able to describe it, automatically reference articles where I talk about updates and have an “Available on the App Store” button next to the app icon. Having apps as their own post type allows us to have additional settings that are only useful for apps. If the App Store URL is present then you get the nice app store button. Besides of the above mentioned infos I also have a place to put the launch scheme and infos for Smart App Banners. 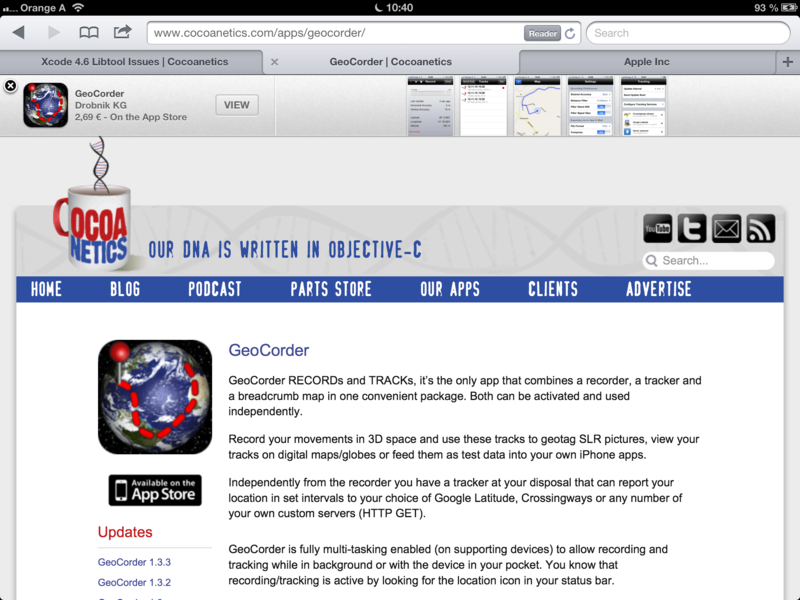 The banners show up automatically if you open the app page on an iOS device. To know which articles are about updates to this app, I just use WordPress tags. If an article has a tag which is the same as this app’s name, then it shows below the app store button. Sure, I could have my apps on their own domains or have a designed landing page for each app, but I just don’t feel that this would be worth the effort. This way I have all activities automated that I can automate. One more thing. In some of my apps I am using DTAboutViewController which shows a grid of all my apps, similar to how Weightbot by Tapbots originally did it. 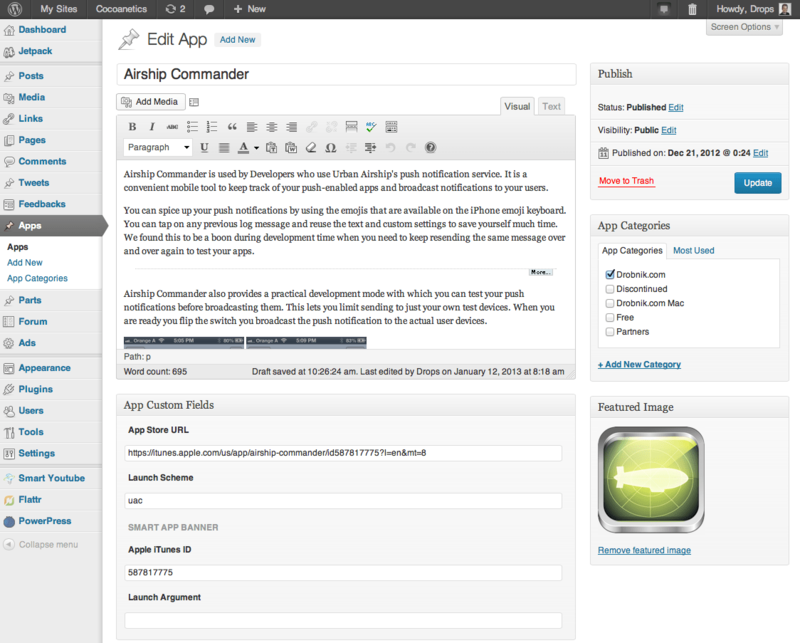 To feed this component I have my WordPress template automatically generated an XML index of my apps. This is just a plain-text plist which I can easily load into a dictionary from the component. I don’t know about you, but my geeky heart just jumps with joy that I don’t have to do anything manually here. With software components (or “parts” as I like to call them akin to a hardware store) the story is similar insofar as that I also want to show a purchase button and tagged updates. The featured image (functionality of WP) does not show an icon, but should represent the part visually. Much less stuff to enter here. 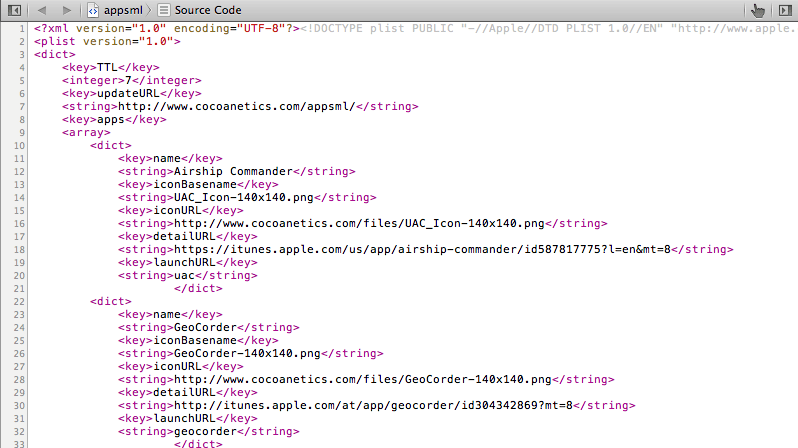 For a while I was also having some third party components in there until I figured that I’d better not. 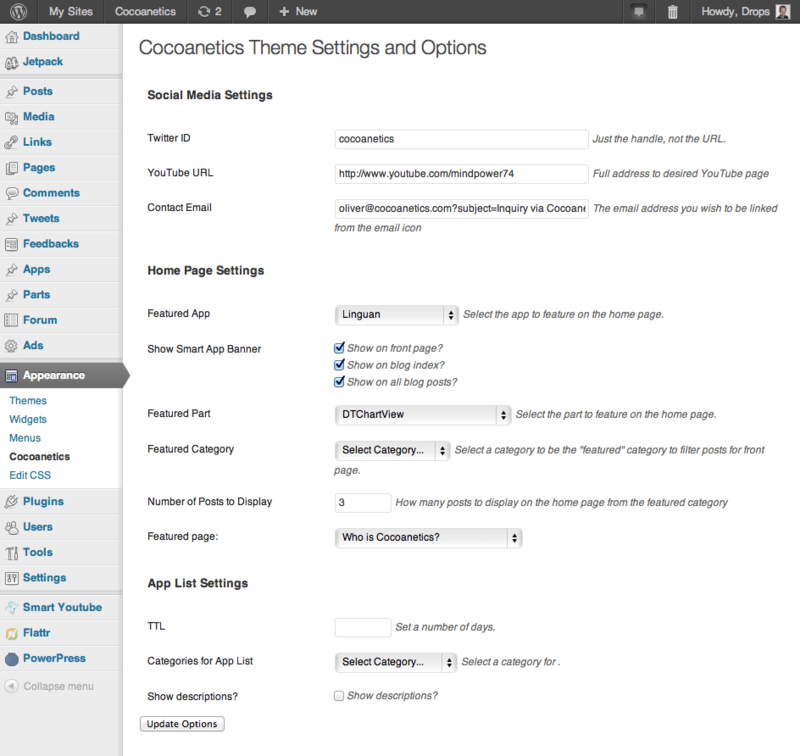 The central place of controlling the behavior of the theme is the special Cococanetics section on the Appearance settings. The Social Media Settings are what occurs if you tap on one of the social buttons at the top right of my site. The Home Page Settings relate to the contents of the cover. This allows me fine-grained control over what part or app to feature, what posts to feature and how many of those. The App List Settings allow some control over the AppML generation mentioned above. Having your own custom theme with so many customizations might not be necessary for somebody like us who is deriving most of their income from contracting work. However I doesn’t hurt to keep polishing it. If anything then it serves to give me a good feeling about writing tutorial, opinion pieces and update articles about our parts and apps. And me feeling good about writing ultimately serves YOU my valued readers.